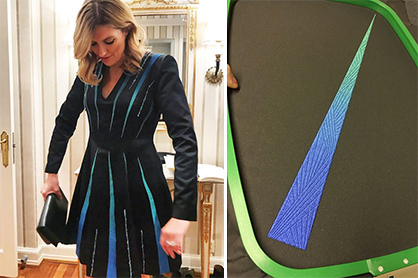 When Beatrice Fihn, Executive Director of ICAN, the Nobel peace prize winner 2017, attended the Nobel Peace Prize Concert in Oslo, she did it in a dress designed by Bahareh Ardakani with the brand Artésir. The dress is made of the finest materials, decorated with luxurious mountain crystals and Embroline embroideries, from the innovative company Coloreel. These unique embroideries are made with more than half a million stitches of 4000 meter Embroline thread softly changing colour from green to blue. With this dress Beatrice is the first person in the world to carry Embroline embroideries in public, apart from embroideries shown by Coloreel at events, fairs and catwalks. The founder of Coloreel, Joakim Staberg, says: “It has been a great honour for us to be able to contribute with our thread colouring technology to a dress worn at such a prominent occasion”. The Coloreel technology enables a high-quality instant colouring of textile thread while the thread is being used in textile production. The first product to be launched based on this technology is Embroline, a groundbreaking thread colouring attachment that can be used with any existing embroidery machine. By instantly colouring a white base thread during the embroidery production, Embroline enables complete freedom to create unique embroideries without any limitations in the use of colours. Colour changes along the thread can be made rapidly from one solid colour to another or gradually, to make smooth transitions or any colouring effect you can imagine. Bahareh says “Embroline opens up entirely new ways of creating embroideries that have not been possible before. The embroideries on Beatrice’s dress is a great example of this. Embroline is definitely the future of embroidery”. Beatrice agrees and adds “I also really cherish the environmental benefits that comes along with this innovative thread colouring technology”.